Dance choreographer Dhinesh makes his debut as an actor in ‘Oru Kuppai Kathai’ which had managed to garner anticipation before its release. If the movie had delivered its goods as promised remains to be seen. 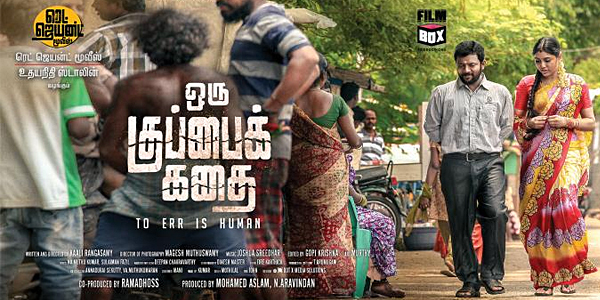 Kumar(Dhinesh) works as a trash collector for Chennai Corporation. Kumar also has a tough time finding a bride to marry owing to his menial profession. 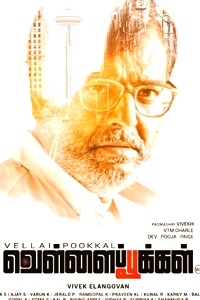 However, he later finds a bride in Poongudi (Manisha Yadhav) and marries her. However, Poongudi after marriage hates the slum life with her husband and returns to her home. After a baby being born, Kumar brings back Poongudi to his new home. And Poongudi wavers into a decision which will change the course of her life. The consequences of her decision and what follows forms the remainder of the story. Dhinesh has rendered a clean performance seasoned actor with ten films under her portfolio. He hasn’t overacted and has managed to give a realistic portrayal in his character. Be it expressing his interest in his profession, exaplaining his profession to father-in-law sans hesitation, or the way he emotes forgiveness in the final scenes, one could say that Dhinesh is a good find as a hero for the Tamil film space. After outings like ‘Aadhalal Kaadhal Seiveer’, ‘Vazhaku En 18/9’, Manisha Yadhav has gotten a meatier role in ‘Oru Kuppai Kathai’. Her portrayal of the character’s shaky decision and the regret that she experiences due to the decision are commendable. Especially towards the climax, Manisha Yadhav dishes out a performance that is sure to make the eyes of the viewers well up. The director could have made use of Yogi Babu’s character much more. Yogi Babu livens up the space even though he appears for a shorter time. Sujo Mathews as the rich youngster, the lady who portrayed Dhinesh’s mother, though given only smaller space in screen time, have dished out out justified performances. Joshua Sridhar’s songs in the film come listenable while the background score is also commendable. Cinematographer Mahesh has photographed the slum locality splendidly through his lens. Director Kaali Rangaswamy has managed to make a movie which explains how wrong decision made by a woman in the family could bring catastrophe, that too very realistically sans cinematic ornamentation. He deserves a kudos for his fine first attempt. Even though the nucleus of the film is about something that we read and hear in news daily, the director has managed to bring out the sorrow and pain with impact. 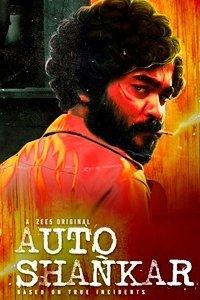 Verdict: Though there are some minor flaws in the film, the drive home message the film is really watchable as a family, as a husband and wife. 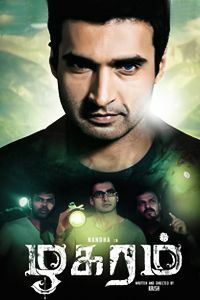 As rare is it is top find a gem in garbage, ‘Oru Kuppai Kathai’ can be rightly said as a gem.